David W. Oestreicher, was elected to serve on the Board of the New Orleans Jazz & Heritage Festival and Foundation, and rose ultimately, to the position of President in 2005 – 2006. Oestreicher actually finished the term of previous board president, Fire Chief Warren McDaniels who stepped down due to his battle with cancer in 2004. Following that, Oestreicher’s and the board faced some dire circumstances. The Foundation was more than $600,000 in debt. There was talk about the direction the Festival was on, and also talk about finding a new producer for the event. As such, Oestreicher, along with the aid of Joan Rhodes, Byron Hughey and Nancy Marinovic decided swift action was needed. This meant issuing an RFP for a new producer, cutting half the staff and looking at questionable areas like ticket sales, which were not being scanned as well as an amorphous transportation contract. The contract of the executive director also was not renewed. In short, Oestreicher and his board discovered that very little at the Jazz & Heritage Foundation was transparent, and they set out to correct it. In a momentous confrontation, the Board decided to renew its deal with Festival Productions, Inc., the long-time producer of the Jazz Fest, a company run by Quint Davis. Other companies bidding on the contract at that time were AEG and Rehage Entertainment. The Foundation required, and Festival Productions, Inc. was able to supply, a significant guarantee. A committee worked behind the scenes further to secure a partnership agreement between FPI and AEG, which resulted in a 15 year long financial agreement that solidified the viability of the Foundation, in return for relinquishing production decisions. Oestreicher also led the board of a national search for a new Executive Director. This resulted in the hiring of Don Marshall. Following that appointment, the NOJHFF brought in Scott Aiges to serve as program director, a position responsible for the now successful series of neighborhood festivals and events put on by the Foundation throughout the year. 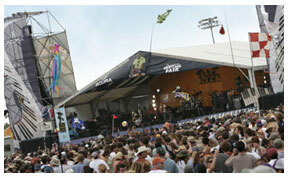 Immediately following Hurricane Katrina, there was some talk about moving the Festival to Houston on a temporary basis. That was averted, and the Fest went on in 2006 at the Fair Grounds in New Orleans. Major sponsors like Shell and Acura signed on and we were well on our way to solvency, with a surplus, as one of the best run non-profits in the area. When Oestreicher’s term came to an end, the Foundation went from a net loss to a surplus in less than two years. Having gone from a deficit to a surplus in a short amount of time is one of the achievements Oestreicher holds up as one of his most satisfying contributions to New Orleans. Oestreicher says, this only goes to illustrate what can be accomplished when tough decisions are made, and when a concerted effort from a group of people is put together for a community good. Today, the Festival enjoys success and large crowds at its rightful home, The Fair Grounds Racecourse in the Gentilly neighborhood of New Orleans. The New Orleans Jazz & Heritage Festival and Foundation, the non-profit that owns the Jazz Fest, also basks in the success of many neighborhood festivals, like the Crescent City BBQ & Blues Fest, which came to fruition in 2006 while Oestreicher was President of the Foundation and also a member of the New Orleans Police and Justice Foundation. Oestreicher, Don Marshall and Carole Berke spearheaded that festival’s launch. The Blues Fest, held annually in Lafayette Square, draws upwards of 25,000 people, and has become one of the NOJHFF’s signature Fall events.